So after much hype during it's first week, and the backlash of DC fans against Rotten Tomatoes, I thought I'd go see the Suicide Squad film and find out what all the hoopla is about, one way or the other. Initially, the first two trailers didn't sit well with me at all and looked extremely lousy. But then after watching the third trailer, which I hadn't even bothered to watch at first — honestly because the first two were that bad — I thought maybe this isn't a pile of junk ... That's when it sank in that it was just one of those things I'm going to have to see for myself. Now I know why there were so many people that liked it as well as hated it. Here's what I thought of it, and what you may or may not like about it. The trailer that gives you a better idea of what to expect. The story, while not absolutely great, wasn't garbage either. It's reminiscent of old–school martial arts films that drop in a character, flash to a bit of back–story telling, then bring you up to current events. As a matter of fact, almost all of the characters are introduced that way. Throwing the history of the characters right up front as an introduction is, as Alan Moore once wrote, "... The easy way out ..." and I'm a firm believer in explaining their stories as you go throughout a new story, that's how you learn about them as you go and it should be woven throughout the film, not force–fed right up front. But the thing that saves these scenes is the visuals and how they handle their delivery mixed with the story at hand. Harley and Deadshot are of course given more time than the other characters, with their scenes, both past and present, making up the majority of the story. The dialogue in many of the scenes, and from many of the characters, was only there to serve it's purpose, which doesn't do much for the story or the depth of the characters themselves and in some instances could be delivered by any action hero. 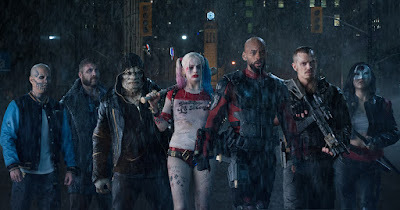 Then there are times when they definitely get more into the wishes and hearts of Harley, Deadshot, El Diablo and Katana, and it's those times that the differentiation between them and a standard Hollywood film character pops out. Unfortunately these scenes are fleeting, only popping in and out once in a while. Still they are done well when they do appear. The first two trailers do not do any of these accompanying scenes justice. Croc was unfortunately used as just a monster. There's more depth to his involvement in the mafia. Slipknot was also very underused — they could've used his chemistry skills. 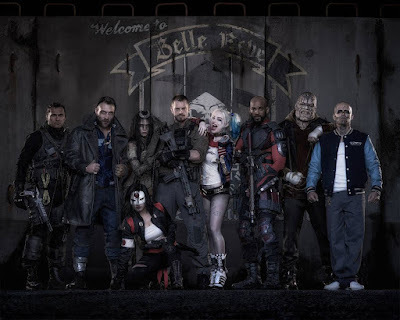 Director David Ayer did a good job in carrying out the scenes, of course he was helped by good deliveries all around from the cast members. But where the content suffered from his dialogue and plot directions, his directing made up for it. Creating a hand–in–hand situation that allowed most scenes to be saved from total recklessness. Overall, he didn't allow his faults to overshadow his strengths and saved himself from falling into a pit of Schumacher-ism (Batman & Robin) or Singer-ism (X-Men) wherein too many of the characters are completely out of context and might as well be given different names. Thank goodness it didn't go that way. No one needs to see more mutilated comic book characters. The soundtrack throughout was just enough classic rock thrown in with the new to make it all click with the neo–punk theme, but not overdone to the point where every instance of the songs were annoying. The editing is done well and lends to the scenes in a way that makes you feel more concerned than you thought you'd be due to the initial set of introductions. Which is a good thing. The feeling that those involved really didn't want to let this film fall short, despite the writing, really shows through and they scrounged to get the most they could out of it and succeeded. (New 52) Suicide Squad # 7 showing Harley's transformation. There were some scenes that I don't believe have ever happened in the Suicide Squad comics or animation; such as those of Harley Quinn that were apparently thrown in because of their use in the story and for visual appeal. This isn't much of a spoiler, because it's been revealed in many sources, but Harley Quinn's incident with a chemical vat is (to the best of my knowledge, please correct me if I'm wrong) non–existent in the comics and animation [Update: Harley was indeed pushed into a vat of chemicals in Suicide Squad (New 52) #6, where the arc starts, and #7, the vat incident — special thanks to Wil Avitt for that]. But they used it to deliver an important element to this film's story: the bond between Joker and Harley. Which is a Mad Love, a psychotic connection wherein none but the two of them get it. As does the fact that Joker's appearances show the value of Harley to him, and vice versa. They'll both be bound together now in film as they are in comics. Would have been harder to do in reverse as most film goers wouldn't have had a clue who Harley was. Now they know more about her and the connection has been established through her eyes more than Mr. J's half–hearted (only missing her when she's gone) feelings toward Harley. What you may like as a comic fan, is the fact that they didn't mutilate the characters beyond recognition. There's a certain leeway these types of comic films require if they're ever to grow into their own thing, because we know they'll almost never be exact replicas of the comics. As long as they don't abuse the actual makeup of the characters themselves — which I don't believe this film did to a hard extent. Harley was still Harley, although missing that edgy class she's had since Paul Dini created her way back for Batman: The Animated Series. Same goes for the other characters, they were all still who they're supposed to be, without major changes that literally make them a separate character. Unlike the X-Men franchise wherein we've seen Juggernaut lose his "mutant" ability with every other mutant ... Which can't happen because he isn't a mutant. His abilities are magical and from a gem he found and threw into space so no one else could have the same abilities. Then there was the ridiculous "Roguelee" incident where they somehow thought it necessary to combine Rogue in the part of Jubilee, who is the real character that looks up to Wolverine as a father figure (and this isn't a hate on Marvel; I'm a Marvel comics fan as well as Image, etc.). Thankfully there was none of that happening here in Suicide Squad. Again, if I'm wrong, please let me know and I'll make changes to reflect that. I'm not big on spreading misinformation about any comic characters that we all love. One of the main things you may not like as a DC comic/cinematic fan is how the film doesn't push itself out of the action film comfort zone. There are all of these great characters that are largely bad, with the exception of Katana, and can be used in ways that make you love to hate them. Although they are acknowledged for the fact that they can be unleashed in times of need because they are the bad guys; that they can be used to destroy and do what they do best and be blamed and hated upon because that's what they are, it would've been nice to see them endorsed more for that in the writing. They are shown a little too much like heroes that are being betrayed by their government. Which isn't the case — they're bad for a reason and being harnessed for a cause. Apparently Amanda Waller, the project operator, is the only one that can see that consistently. Hopefully the success of this film will spawn more of a "love to hate 'em" feeling if we see a sequel. Overall I would give this a 65% rating — and while some people keep toting that Marvel hasn't turned out a bad film for a long time, or that DC needs to follow their lead, I don't believe that. 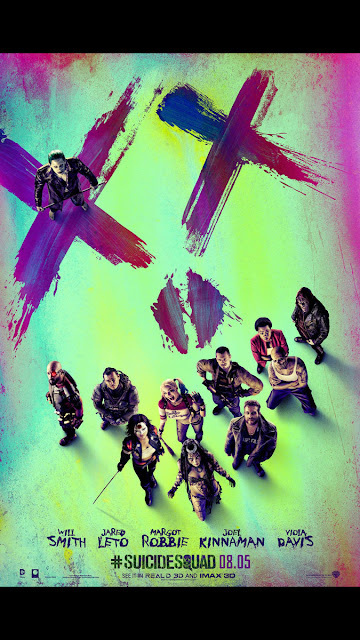 Suicide Squad — while not amazing — is definitely more entertaining than the X-Men franchise with the exception perhaps of X-Men 2, First Class and Days of Future Past. All of which had absolutely terrible character and lineup flaws, but still managed to be entertaining films, as did Suicide Squad.